Heavy rainfall and the subsequent release of significant volumes of water through the curtain contributed to it malfunctioning in 2016. The curtain has been reinstalled following repairs and extensive work to engineer a revised design. Cold water pollution can occur when cold water from the bottom of a dam is released into the river. This can have a negative impact on native fish species. WaterNSW is working to mitigate the effects of cold water pollution as part of its ongoing efforts to reduce environmental impacts of operations. The project involved construction of a floating-curtain temperature control structure around the intake tower at Burrendong Dam. The flexible structure sits just below the water level to allow warmer surface water to be released downstream through the outlet valve. The curtain can move up and down with the water level via a chain and pulley mechanism to function regardless of the water level of the dam. The curtain is designed to reduce the effects of cold water being released downstream on native fish species in the Macquarie River. 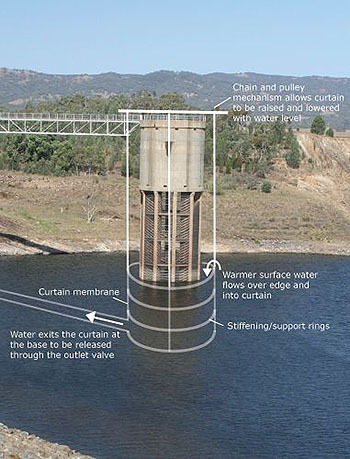 The temperature control curtain is designed to release warm water from the surface of the dam to allow the water downstream to be in a range more habitable for native fish. By restoring temperatures in the river the project is set to improve the ecology of the river which is temperature dependent. Phone: 1300 662 077 or email.